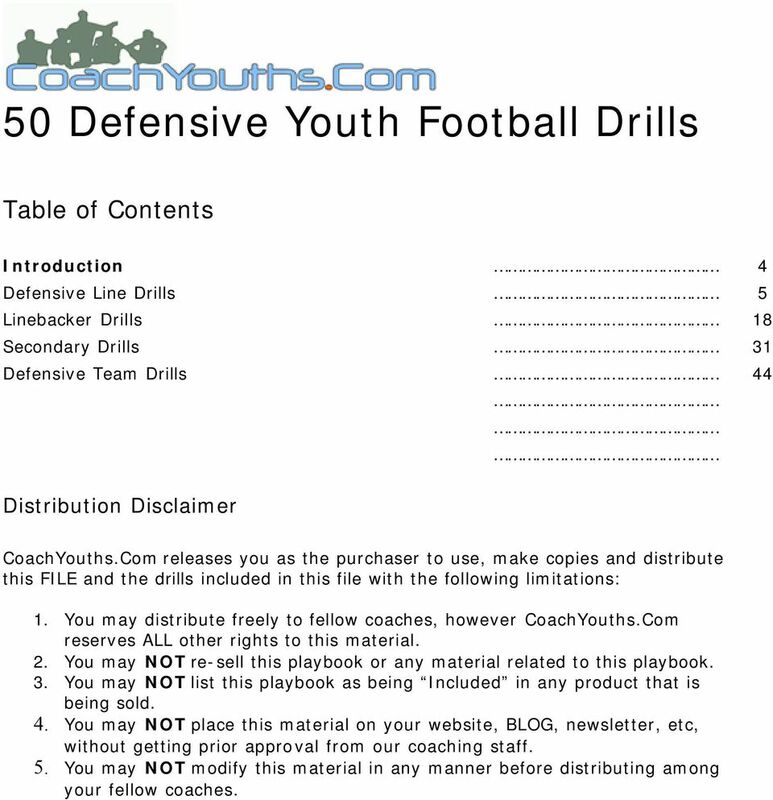 Download "50 Defensive Youth Football Drills"
3 50 Defensive Youth Football Drills Table of Contents Introduction 4 Defensive Line Drills 5 Linebacker Drills 18 Secondary Drills 31 Defensive Team Drills 44 Distribution Disclaimer CoachYouths.Com releases you as the purchaser to use, make copies and distribute this FILE and the drills included in this file with the following limitations: 1. 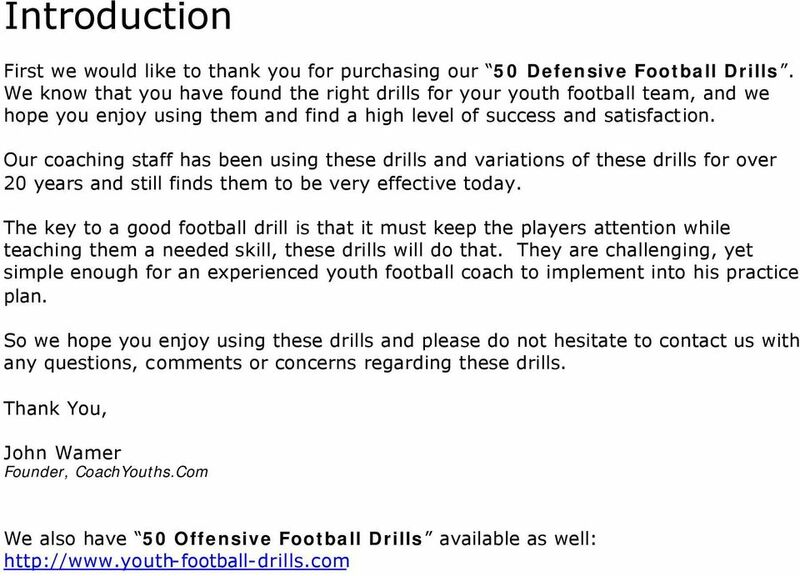 You may distribute freely to fellow coaches, however CoachYouths.Com reserves ALL other rights to this material. 2. You may NOT re-sell this playbook or any material related to this playbook. 3. You may NOT list this playbook as being Included in any product that is being sold. 4. You may NOT place this material on your website, BLOG, newsletter, etc, without getting prior approval from our coaching staff. 5. You may NOT modify this material in any manner before distributing among your fellow coaches. 6 3-on-2 Drill To teach defensive linemen to react to and recognize different schemes All Defensive Linemen 1) Three offensive linemen line up on line of scrimmage with two defensive linemen across the LOS. 2) The coach stands behind the defensive linemen to signal the scheme and the snap count, the coach also calls the cadence. 3) The coach teaches the defensive line to watch the ball and to get off the line at the snap. 4) The defensive line reacts to the blocking scheme on the run. 1) At the snap the DL take a proper gap control step, then read and react to blocking scheme, do not try to guess the scheme. 2) The diagram is for an inside TRAP play, the coach should have the scout offensive line run several different blocking schemes. NOTE: This is an excellent drill for improving recognition of blocking schemes and reacting to schemes. 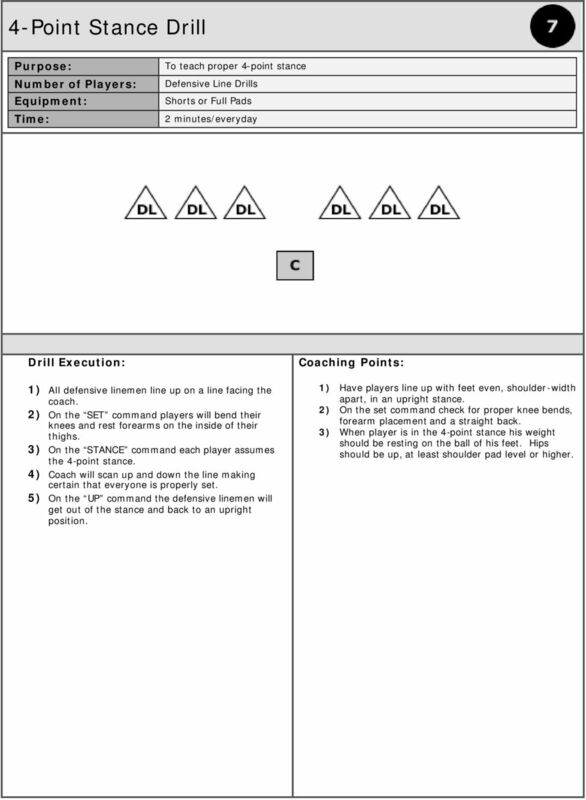 7 Hustle Drill To improve pass rushing technique and pass pursuit technique All Defensive Linemen 1) Five defensive linemen line up across from five offensive linemen as diagramed above. 2) Five wide receivers line up downfield as diagrammed between yards deep. 3) Mark the pass lines with spray paint or tape if available so the defensive line can practice the proper rush lane. 4) On the QB snap one defensive linemen will go at a time, and will have 4 seconds to beat the block and get to the QB which will make a 7-step drop. 5) If the DL does not touch the QB in four seconds the QB will throw the ball downfield and the DL will have to sprint to the WR with the ball. 1) The DL has to react to the snap of the ball not the cadence, should be watching ball not anticipating the snap count. 2) During the pass rush the DL works on technique and staying in the proper rush lane. 3) This can become an excellent conditioning drill for your DL. 4) Once the DL has gone his turn he will rotate to the OL side. NOTE: DL should focus on technique and execute drill faster as his technique improves. OL should make all out effort to make a block. 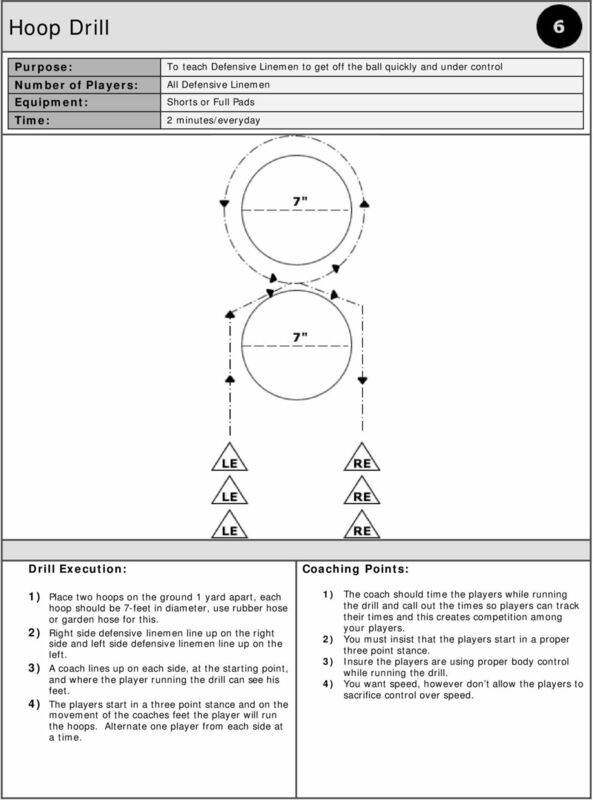 8 3-on-1 Drill with Cones To teach the defender to deliver a blow, separate and pursue the ball carrier. Defensive Line Full Pads 1) The setup has a Center, two guards and a ball carrier, these players can be actual offensive players, or can be played by the defensive linemen who are not currently running the drill. 2) You will need to place the cones as illustrated above to simulate the offensive tackles and tight ends, and to create a lane for the ball carrier to run through. 3) The coach will give the snap count to the offense, then will position himself behind the defensive player (the triangle), the coach will then signal to the offense the direction (left or right) they play will be run to, without the defender knowing. 4) The coach will call out the snap count and the offense will execute the play as drawn to either side. The diagram is to the right side, so based on the diagram, the guard will attempt an inside block on defender, the defender will explode into the block with his hands to create separation, then will pursue the running back to the hole, where he will have to separate again from another blocker, then make a tackle on the back. 1) The coach should be checking for proper starting stance. 2) The defender should maintain a low center of gravity so that he can explode into blockers and create separation. 3) Insure that the defender is exploding with both hands into the chest of the defender to keep him separated from blocker. 4) NOTE: This drill can be run at full speed, or full speed until the tackle is going to be made and have the players not make a full tackle, unless you want to work on tackling while doing this drill. 10 Leverage Drill To Defensive End the proper reaction to offensive blocks All Defensive Linemen 1) Coaching Leverage: a. The DL is shaded (offset, not head-up) off the offensive linemen. b. The OL starts the drill by attacking the DL near pad. c. The DL attacks and squeezes the OL, he keeps his head and eyes in his gap until the coach signals to release and crossface or to push into his gap. 2) Coaching Reach Technique: a. The DL is shaded (offset, not head-up) off the offensive linemen. b. The OL starts the drill by attacking across the far pad of the DL. c. The DL uses his hands to keep the OL off his legs and works to gain an outside position. 3) Coaching Low Block Technique: a. The DL is shaded off the OL, the OL starts the drill by low blocking on all fours to the far knee of the DL. b. The DL responds by getting helmet on helmet contact and hands on shoulder pads, to force the OL away from his knees, then pushes up field. 1) Teach the proper use of hands and feet during all drill variations. 2) Teach the proper release off the offensive block during each repetition, help it become instinctive and muscle-memory. NOTE: All Defensive linemen will sprint 5-10 yards up field upon completion of each drill. 11 Hoop Drill To teach Defensive Linemen to get off the ball quickly and under control All Defensive Linemen 1) Place two hoops on the ground 1 yard apart, each hoop should be 7-feet in diameter, use rubber hose or garden hose for this. 2) Right side defensive linemen line up on the right side and left side defensive linemen line up on the left. 3) A coach lines up on each side, at the starting point, and where the player running the drill can see his feet. 4) The players start in a three point stance and on the movement of the coaches feet the player will run the hoops. Alternate one player from each side at a time. 1) The coach should time the players while running the drill and call out the times so players can track their times and this creates competition among your players. 2) You must insist that the players start in a proper three point stance. 3) Insure the players are using proper body control while running the drill. 4) You want speed, however don t allow the players to sacrifice control over speed. 12 4-Point Stance Drill To teach proper 4-point stance Defensive Line Drills 1) All defensive linemen line up on a line facing the coach. 2) On the SET command players will bend their knees and rest forearms on the inside of their thighs. 3) On the STANCE command each player assumes the 4-point stance. 4) Coach will scan up and down the line making certain that everyone is properly set. 5) On the UP command the defensive linemen will get out of the stance and back to an upright position. 1) Have players line up with feet even, shoulder-width apart, in an upright stance. 2) On the set command check for proper knee bends, forearm placement and a straight back. 3) When player is in the 4-point stance his weight should be resting on the ball of his feet. Hips should be up, at least shoulder pad level or higher. 15 Hook Block Protection Drill: DL To teach defensive linemen how to react and defeat a hook block All Defensive Linemen 1) Split your defensive linemen into 2 groups. One group will play the role of offensive linemen while the other group runs the drill a their respective defensive line position. 2) Have the two groups line up facing each other as illustrated above. 3) The coach will tell the defensive players their gap responsibility, either left or right. 4) On the Stance command the players will get into their starting stance. 5) The defensive linemen will focus on the ball. 6) On the HUT command the Center will snap the ball to the coach and the blockers will step to the side assigned by the coach to make a hook block on the defensive player across from them. 7) The defensive player will shed the block attempt and push into the backfield in his respective rush lane until the whistle is blown. 8) Repeat the drill and then rotate sides. 1) While the defender starts his rush on the snap he should see the head and upper body of the offensive linemen attempting to move to his outside for the block. 2) When he sees this action the defensive linemen should strike the shoulder pads and upper body of the blocker with his hands straight ahead. 3) The defensive linemen should continue extending his arms after the initial contact; this will help create separation from himself and the blocker. 4) At this point he will be separated from the blocker and will drive him down the line, this will help force the play inside the block, inside of allowing a play to bounce outside. 5) It is VERY important to for the defensive linemen to keep his head outside of the blocker and shoulders squared to the opposing backfield to maintain proper balance. 6) Also insure your players maintain a wide base at their feet, not too narrow and not extremely wide, shoulder-width or just outside the shoulders is perfect. 16 Target Rush Drill: DL To teach Defensive Linemen how to properly rush a target area All Defensive Linemen 1) First align your defensive line on the line of scrimmage. The coach will assume the center position and simulate snapping the ball. Place a cone or other marker to designate where the QB will be. 2) On the STANCE command the defensive linemen who is running the drill will assume the proper starting stance. 3) When the player is set in his stance the coach will grasp the ball and simulate a snap count and then a snap. The defensive linemen will react to the snap. 4) The defensive lineman will rush the QB until the whistle is blown, then rotate to the next player or repeat. 1) Insure that your defensive linemen are making their first step forward, do not allow them to step backwards at all, explain to them that by stepping back even a half step is automatically giving up ground to the offense. 2) The defensive lineman s initial charge should be low but the body should rise as he gets closer to the QB. 3) Empathize that every player plays until the whistle, meaning they should run thru and past the QB area until the whistle is blown, not just to it and then stop. 17 Bull Pass Rush Drill To teach the defensive linemen to properly rush the QB. All Defensive Linemen and Offensive Linemen Full Pads 4 minutes/twice weekly 1) Align your offensive line and your defensive line on the ball, place the QB or a marker simulating the QB 4-5 yards behind the line of scrimmage. 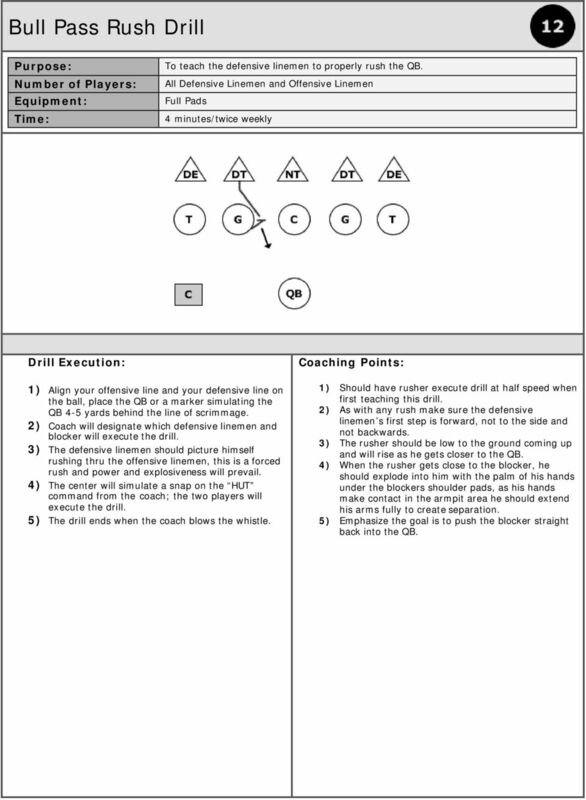 2) Coach will designate which defensive linemen and blocker will execute the drill. 3) The defensive linemen should picture himself rushing thru the offensive linemen, this is a forced rush and power and explosiveness will prevail. 4) The center will simulate a snap on the HUT command from the coach; the two players will execute the drill. 5) The drill ends when the coach blows the whistle. 1) Should have rusher execute drill at half speed when first teaching this drill. 2) As with any rush make sure the defensive linemen s first step is forward, not to the side and not backwards. 3) The rusher should be low to the ground coming up and will rise as he gets closer to the QB. 4) When the rusher gets close to the blocker, he should explode into him with the palm of his hands under the blockers shoulder pads, as his hands make contact in the armpit area he should extend his arms fully to create separation. 5) Emphasize the goal is to push the blocker straight back into the QB. 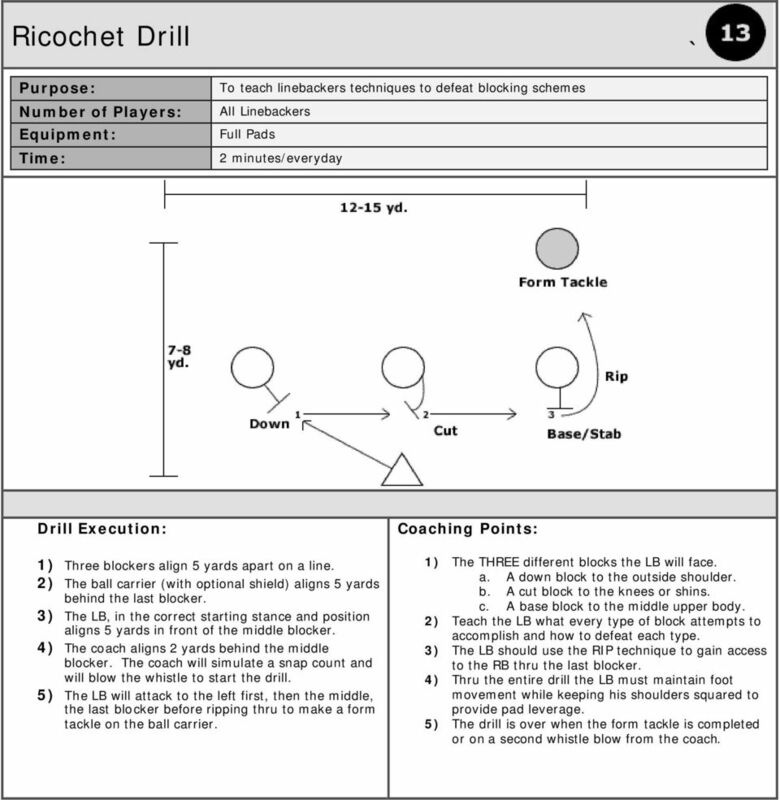 19 Ricochet Drill ` To teach linebackers techniques to defeat blocking schemes All Linebackers Full Pads 1) Three blockers align 5 yards apart on a line. 2) The ball carrier (with optional shield) aligns 5 yards behind the last blocker. 3) The LB, in the correct starting stance and position aligns 5 yards in front of the middle blocker. 4) The coach aligns 2 yards behind the middle blocker. The coach will simulate a snap count and will blow the whistle to start the drill. 5) The LB will attack to the left first, then the middle, the last blocker before ripping thru to make a form tackle on the ball carrier. 1) The THREE different blocks the LB will face. a. A down block to the outside shoulder. b. A cut block to the knees or shins. c. A base block to the middle upper body. 2) Teach the LB what every type of block attempts to accomplish and how to defeat each type. 3) The LB should use the RIP technique to gain access to the RB thru the last blocker. 4) Thru the entire drill the LB must maintain foot movement while keeping his shoulders squared to provide pad leverage. 5) The drill is over when the form tackle is completed or on a second whistle blow from the coach. 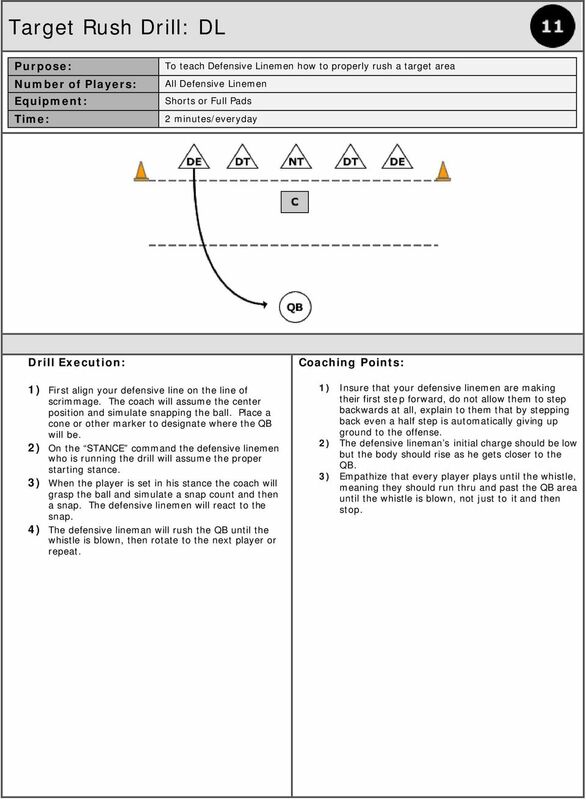 20 Box Reaction Drill To teach linebackers to change direction while keeping eye on the ball All Linebackers 1) The drill station is a 10-yard square, with a cone or other marker at each corner. 2) Two LBs line up 1 yard apart on the baseline facing the coach. 3) To start the drill the coach blows a whistle, the LBs focus on the ball in the coach s hands and goes in the direction he points it. a. As the coach points straight back the LBs will backpedal. b. As the coach points at a cone in either corner, the LBs respond by opening their hips and performing crossover runs. c. As the coach points to different areas the LBs reset and respond in that direction. d. To end the drill the coach points at a spot directly in front of him, the LBs plant their feet and sprint to him, the coach will toss the ball in front of the and the LBs should attempt to intercept it at the highest point, then sprint thru the coach. 1) The LBs need to learn how to move and react quickly in different directions without losing control of their bodies. 2) The LBs must keep their feet up and under, or they will lose their base and slip and fall. 3) Thru the entire drill the LBs should maintain eye contact with the coach and the ball in his hands. 4) The LBs should move to the specific point without looking at it. 21 Linebacker Skate Drill To teach linebackers to defeat high or low blocks All Linebackers 1) To drill OUTSIDE LBs: a. The offensive players align as diagrammed on the right side above. b. For drill purposes the ball carrier will be the TB. c. The outside LB will align to the outside shade of the TE. d. The coach will callout a snap count, on the center s snap the TE will attempt an outside hook block, the RB (with ball) will sweep outside, and the FB will lead block outside and attempt a cut block on the outside leg. e. The LB will defeat the hook block by exploding his hands into the outside shoulder of the TE and extending his arms for separation. f. The LB will defeat the CUT block by lowering his body and exploding his hands into the FB s helmet as he goes down, forcing the FB into the ground before he gets to the legs of the LB, and the LB will make a small outside shuffle step to create enough separation to avoid the block. g. Makes a good form tackle. 2) To drill INSIDE LBs: a. The inside LB aligns to the outside shade of the G at a 4 yard depth. b. At the snap the G attempts to block the LB, who defeats it with a rip technique. c. The Lb then defeats the cut block as described above d. The LB executes a good form tackle on ball carrier 1) Insure the LB maintains a good hitting position thru the entire drill. 2) Teach the LBs to defeat low blocks with their hands, not jumping over the blockers. Explain to them that although they may get away with jumping the block attempt that they cannot change movement directions in mid-air and this could allow the RB to make a quick cut and avoid the tackle, effectively taking themselves out of the play. 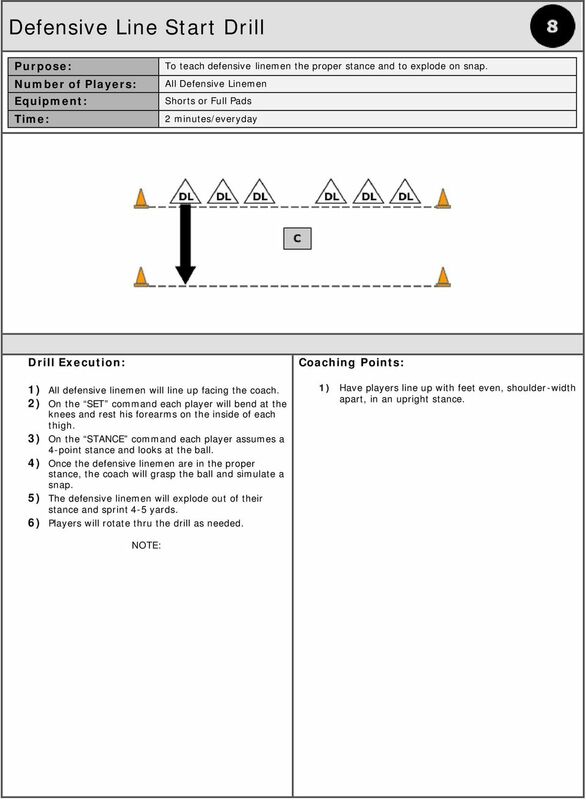 3) Start executing this drill at half speed then increase the speed. 22 Downhill Shuffle Drill To teach LBs to attack the line and use hands to avoid blocks All Linebackers 1) Place FOUR bags at an angle within a ten yard area. (If no bags are available a line of cones or strips of rope or even rubber hose will work, just insure the LBs are forces to raise their feet to clear 8-12 inches. 2) Four blockers align between the bags (diagrammed above). 3) The ball carrier aligns 10 yards outside the last bag. 4) Facing the blockers the LB aligns left of the first bag. 5) On the whistle the LB steps with his near foot to shuffle over the bag. 6) Within the bag area the blocker steps forward and exposes his chest when the LBs trail foot hits inside the bag area. 7) The LB will string the chest area of each block with the palm of his hands and extend his arms to create separation before shuffling to the next blocker. 8) Blocker #4 will attempt a low block after the LB has crossed the last bag. 9) After shedding the low block the LB will sprint to the ball carrier and perform an angle tackle. 1) Insure the LB assumes a good starting position and that he maintains a good position throughout the drill. 2) The LB wants to keep is center low, by always keeping his tail just below waist level so he can spring into is opponent, insure the LB is not standing straight up as he shuffles. 3) The ball carrier does not move until the LB has shed the low block and the drill is not over till the whistle is blown. 23 Linebacker Shoulder Blast Drill To teach LBs skills to defeat blocks while pursuing the ball. All Linebackers 1) On a line three blockers align one yard apart. 2) Facing the blockers in a good starting stance, the LB aligns two yards in front of them. 3) The coach stands behind the LB and signals each blocker when to attack. 4) On blocker movement the LB attacks and explodes into the blocker using his outside shoulder and hands to create separation. 5) After exploding into and defeating the first two blockers the LB resets to the starting position. 6) On the third blocker, the LB explodes into the blocker s chest with both palms, locks out his arms and drives the blocker backwards. 1) When attacking the blocker the LB s aiming point is the chest. 2) The LB should start his attack with a power step (inside foot) that splits the crotch of the block, causing him off balance. 3) When the executing the lockout technique the LB bends his knees and arches his back. NOTE: All ball carrier can be added, if so the LB sheds the blocker and makes a form tackle from the lockout position on the last blocker. 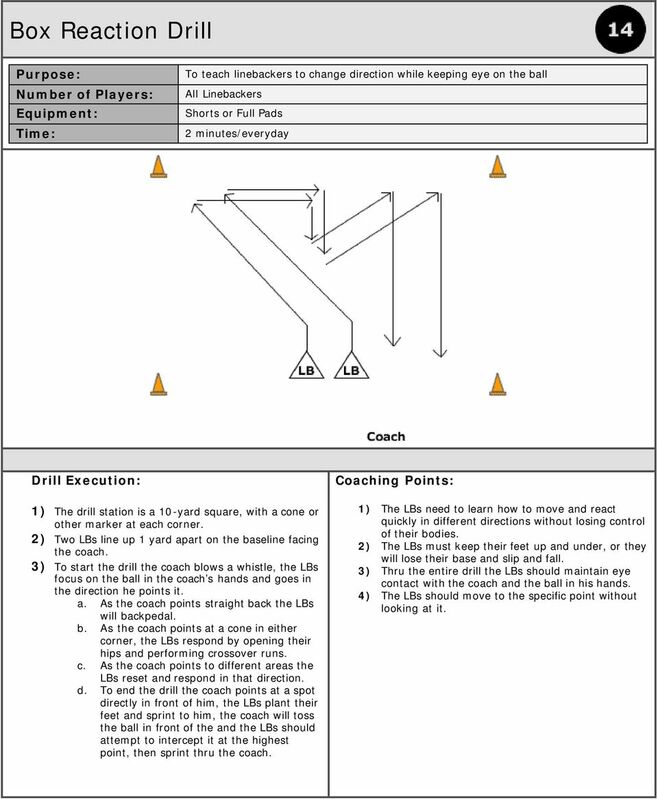 24 Open Field Tackling Drill To teach LBs proper angles and body position during open field tackling All Linebackers 1) Organize 5 cones 2 yards apart as illustrated above. 2) Place two dummies or two rows of 3-4 cones each at an angle to create a running lane that the ball carrier must stay within. 3) The defender (triangle) starts at one end 10-yards away from the cone group, while the ball carrier starts at the other only 5 yards away from the cones. 4) The drill starts on the coach s command, either on a whistle blow or verbal command. 5) The ball carrier starts thru the cones and breaks in either direction, while the defender attacks the cones in the same direction as the ball carrier. 6) While moving at full speed the defender must attack under control and execute a proper angle tackle. 1) The defender should always start the drill twice as far from the cones as the ball carrier since he will be required to cover more ground on game day. 2) As your defenders improve you may allow the ball carrier to perform a fake in one direction or even a cut back to truly test your linebackers. 3) Teach the ball carrier to run up field when coming out of the cones, not away from the defender. 4) The linebackers should work his way inside out on the ball carrier by attacking his hips; he will tackle across the front of the ball carrier with his body. 5) Teach your defenders to force the ball carrier to the sideline or back inside to the heart of the defense, but not to allow them to get the outside on them. 25 2-Point Stance Drill To teach linebackers the proper 2-point stance. All Linebackers 1) Have all of your linebackers lineup in a line facing you. 2) On your command of STANCE, each player will bend at the knees and get into a proper 2-point stance. 3) The coach will scan the line to insure all players are in correct stance and fix the ones who are not. 4) On the command of UP the players rise back to the upright relaxed position. 5) Repeat as required. 1) Early on you should go down the line one player at a time to insure that EVERY player gets one on one corrections and demonstration of the stance. 2) Players should: a. Be lined up with their even; b. Feet shoulder width apart; c. In an upright stance. d. All players bend at the knees, position their shoulders slightly in front of the knees. 3) Outside linebackers should adjust so that their outside foot is back. 26 Start Drill: LB To teach linebackers the proper alignment to the ball All Linebackers 1) Group your linebackers in to groups based on the number you will have on the field at one time, for example if you run a 4-3 or 5-3 you will have them in groups of 3. Have then lineup on you, as if you were the ball. 2) On the STANCE command they will assume an appropriate 2-point stance. 3) The coach should grasp the ball, simulate a snap then move left or right and the linebackers should react accordingly. 4) Reset and repeat as required. 1) Go one player at a time early in the season to insure every linebacker gets one on one coaching if needed. 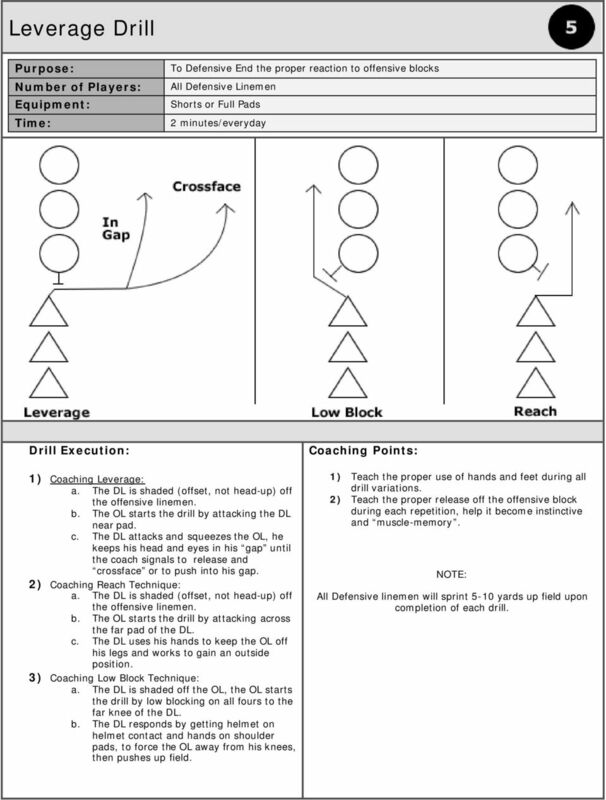 27 Drive Block Protection Drill: LB To teach linebackers to defeat the drive block All Linebackers and scout team offensive line 1) Have your linebackers line up properly facing an offensive line, coach will assume the position of QB. 2) The coach will tell the LBs their gap responsibility, either left or right. 3) On the STANCE command all players get into the proper stance. 4) Linebackers should focus on the ball, NOT the snap count. 5) On the HUT command the center snaps the ball to the coach and the blockers move forward to drive block the defenders backwards. 6) The linebackers react to the blockers. 7) Coach either calls STOP or blows the whistle to end the drill. 8) Players rotate, switch positions or repeat as required. 1) On the snap the linebacker steps forward with small, powerful steps. 2) As he comes forward he needs to keep his shoulder pad level below that of the offensive linemen. 3) Once the blocker gets close, the LB should explode with both arms forward with his palms striking the blocker in the chest, it should be a up and out motion if the linebackers pad levels are low enough. This will create leverage and separation. 4) The LB should then shed the blocker the side opposite his assigned gap responsibility or drive the blocker backwards into the backfield. 28 Hook Block Protection To teach linebackers to defend against a hook block All Linebackers 4 minutes/twice weekly 1) Have your linebackers line up properly facing an offensive line, coach will assume the position of QB. 2) The coach will tell the LBs their gap responsibility, either left or right. 3) On the STANCE command all players get into the proper stance. 4) Linebackers should focus on the ball, NOT the snap count. 5) On the HUT command the center snaps the ball to the coach and the blockers move forward to hook block the linebacker in front of him 6) The linebackers react to the blockers. 7) Coach either calls STOP or blows the whistle to end the drill. 8) Players rotate, switch positions or repeat as required. 1) As the blocker comes of the line the linebacker will see the offensive linemen coming to either his inside or outside, but not directly at him. 2) When a linebacker sees this, he should recognize a hook block. 3) The linebacker should fire both hands straight ahead, making contact with his palms on the shoulder pads and upper body of the blocker. 4) He should then extend his arms, creating separation, and drive the blocker down the line of scrimmage, keeping his head on the side of the blocker that is his gap responsibility. NOTE: The LB will drive the blocker down the line not backwards like against a drive block because a hook block is NORMALLY used on an outside run, sweep or bootleg type play. 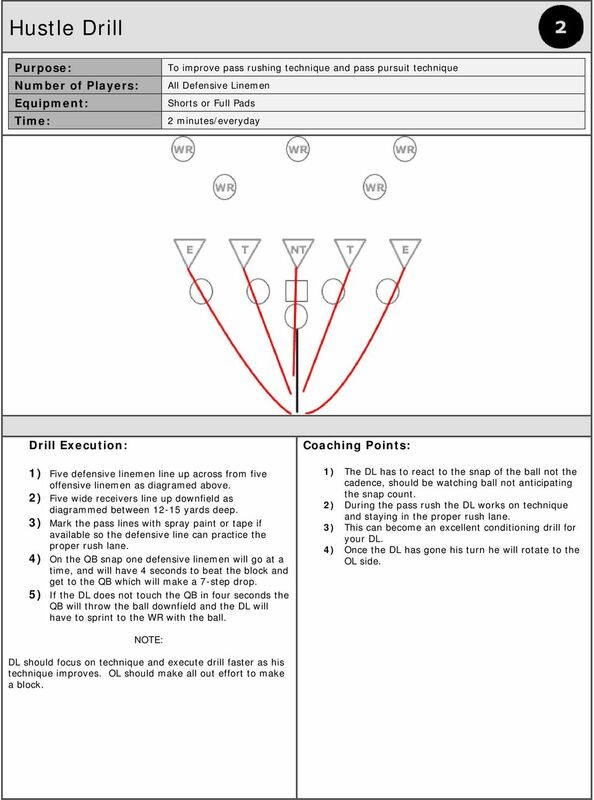 29 Target Rush Drill: LB To teach linebackers to rush to a specific area or target All Linebackers 1) Coach should place a cone, marker or even dummy directly behind the center 6-7 yards deep. 2) The coach instructs the linebackers that this represents the QB and that is the target area that they are rushing to. 3) On the STANCE command the linebackers assume a proper 2-point stance. 4) Once the LBs are setup properly the coach will simulate a snap count and a snap. 5) On the snap the LBs will sprint to the target, at the line of scrimmage they will slow up for a step or two, then back to full speed. This will teach the linebackers to blitz under control to prevent a misdirection type play or an agile QB from making them miss. 1) Empathize to your LBs that their first step is ALWAYS forward, never back and never sideways. 2) The initial charge is straight at the line of scrimmage; the linebacker doesn t start angling towards the target until past the line. This keeps them in their gap of responsibility. 3) Players should always have their heads up and eyes open. 4) Players continue past the target area or until the whistle blows. 30 Bull Pass Rush Drill To teach linebackers the bull rush technique for pass rushing All Linebackers 1) Coach designates which LB and blocker will run the drill, only one pair at a time will run the drill. 2) Prior to starting the drill the LB should picture the spot where the QB will be setup once the play is run. 3) On the HUT command the blocker sets up to pass block. 4) The LB watches the ball snap and begins his blitz and see the offensive linemen setting up to pass block. 5) Once the LB has pushed the blocker back to the target area the coach blows the whistle or calls STOP 6) Rotate, switch sides or repeat as required. 1) When first teaching this pass rush technique have the LBs go at half speed so they are using the technique not just trying to outrun the linemen, cause that wont always work on game day. 2) As always the first step is FORWARD. 3) The LBs initial charge is towards the line. 4) As he nears the blocker, he shortens his stride, lowers his hips and keeps moving forward. 5) Both hands come up, palms facing the blocker and LB drives hands under the shoulder pads of blocker. 6) As he makes contact he should extend his arms to create separation. 7) LB should be prepared to continue angle to QB and be ready to engage block again since the blocker is willing to give up some ground to retreat backwards and reset for a better block. 8) Set the goal for the LBs to force the linemen back into the QB if they cannot beat them outright. 32 Hands Drill To teach defensive backs to read the hands of wide recievers All Defensive Backs 1) WR aligns 8-12 yards from the sideline with the DB one yard inside and 3 yards behind. 2) The QB or coach aligns yards from the players on the line of scrimmage. 3) On command one group of players release downfield. 4) Once 15 yards downfield the QB throws the ball over the outside shoulder of the WR. 5) The WR fades to the sideline to make the catch. 6) The DB closes the gap and breaks on the ball by watching the WR s hands, not the ball. 1) The WR will tip off the location of the ball by his hand placement. 2) The DB s inside hand should be between the WR and the ball. 3) If ball is caught the DB should strip the ball with the inside hand. 4) DB should insure that the opposite hand is in position to grab on to make a tackle if ball is caught. 5) DB should not look at ball until he is in position to make a play and has closed the gap. NOTE: This technique is mainly focused for man-to-man coverage, however will still help during zone coverage situations as well. 33 Weave Drill To teach techniques to keep proper width and depth cushion on a receiver. All Defensive Backs 1) The WR lines up on the line of scrimmage with the DB aligned properly across the line. 2) On command the receiver heads downfield at about ¾ speed, the WR will take off at an angle and weave back and forth ever so often. 3) The DB will keep a proper 1-2 yard cushion and will rotate at the hips when the receiver makes a change in direction. 4) If the DB loses his 1-2 yard cushion he will turn completely to the receiver and sprint to catch up. 1) Teach the DB to key off the WR s hips to tell when the receiver is going to change direction. Do not allow DB to focus on the feet or upper body of WR cause they can be tricky. 34 Triangle Block Drill To teach defensive backs how to defeat downfield blocking by wide receivers All Defensive Backs 1) DBs align in a three deep look; CBs 7-9 yards off each WR and the SAFETY about 12 yards deep. Align WRs to the right and left of the QB (or coach). The ball carrier aligns 5-7 yards behind the QB to receive the pitch. 2) To begin the drill the defensive coach (standing behind the defense) signals the play direction to the offense so that the defense does not know. 3) As the ball is pitched the WRs come off the line to block and the DBs perform a pass-run read. 4) After identifying a run play the CB reacts to defeat the WRs downfield block, containing the run and forcing the ball carrier inside. Or the CB will tackle the ball carrier if he runs outside. 5) If the ball carrier runs inside the safety makes the tackle while the far side CB is in a good pursuit angle to assist the safety. 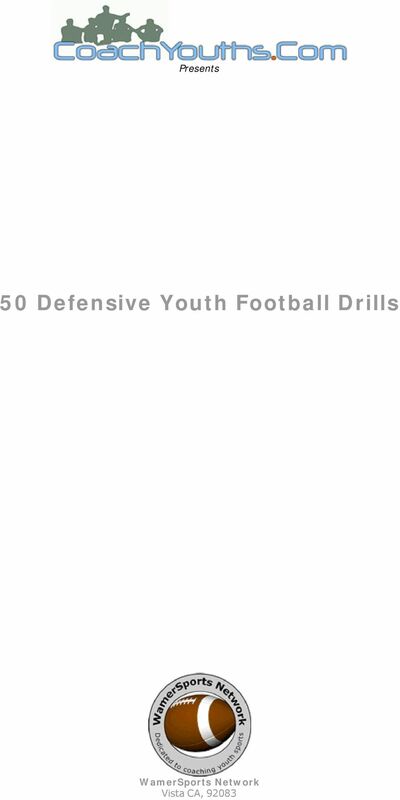 1) Work in groups of 3 or four depending on your defensive scheme you can add an additional safety to the drill. 2) Have the QB mix in a few pass from time to time to insure the defense is being honest and doing their run-pass reads. 35 Play the Pass Drill To teach defensive backs pass coverage techniques All Defensive Backs 1) Prior to the drill the DB should practice the backpedal and be able to change directions (see weave drill) and understand and recognize pass patterns. 2) To start the drill, the DB lines up on a WR in man coverage. 3) The WR runs an OUT, IN or GO patent and the DB plays the ball. NOTE: 1) In man coverage the DB always keeps eye contact on the receiver while looking for the ball. The DB must never look away from the receiver. 2) If unable to make an interception or deflect the pass, the DB will tear away the up field arm of the receiver. This is the arm farthest from the flight of the ball. 3) The DB knows that an incomplete pass gains no yards, which is a plus. 4) The coach emphasizes that each player should be the best at his position, maintain peak condition, and know his responsibility. 36 Zone Break Drill To teach defensive backs fundamentals for reading the QB All Defensive Backs 1) As a stationary WR aligns on each hash mark, the DB splits the difference and aligns between them. 2) The QB (coach) aligns 15 yards directly in front of the DB. 3) On the ball movement the QB takes a 3-5 step drop, at the same time the DB pedals backwards. 4) As the QB sets, he will turn his eyes and shoulders to the WR he will pass to. 5) The DB reads the QB by checking his eyes and shoulders. 6) As the QB s free hand comes off the ball, the DB plants drive and attempts to intercept the ball at its highest point, tucks it way and sprints downfield past the QB or until the whistle blows. 1) Emphasize a correct stance and proper backpedaling technique while the DB reads the QB. 2) On the break the DB s eyes are on the WR, after accelerating his eyes are on the ball. 3) Coach the DB to gain ground as quickly as possible to avoid taking false steps. 4) The DB looks the ball all the way in, he catches it at the highest point. 37 Vertical Coverage Drill To teach defensive backs how to play vertical routes All Defensive Backs 1) Align your DBs and WRs with a QB (or coach) as illustrated above. 2) On the snap all WRs run an outside release and a vertical GO route. 3) On the snap the DBs drop back into zone coverage. a. CBs release to the outside 1/3 of the field, and the safety has the middle 1/3. 4) DBs have to not allow any receiver past them in their zone the DB should always be the furthest downfield in his zone, and possible catch should be made in front of him, not behind. 1) DBs maintain a 5-yard cushion on all WRs 2) The DB backpedals at full speed to his respective zone, if the WR gets almost even with him the DB needs to turn his hips to the inside and sprint at full speed, do not wait till the WR is even with the DB cause it will be too late and the WR will be past the DB. 39 Start Drill To teach defensive backs how to start off the snap All Defensive Backs 1) All defensive backs get on line facing the coach (see above). 2) The coach calls out a STANCE command and the players get into the proper stance. 3) Scan line to insure everyone is correct, make any corrections. 4) On the HUT command all players will start by taking 2-3 steps straight back. 5) Repeat as required. 1) Early on go one at a time to allow one-on-one corrections. 2) The DBs should learn to push off with the front foot, not the back. 40 Backpedal Drill To teach defensive backs how to properly backpedal All Defensive Backs 1) All defensive backs line up on line facing the coach. 2) On the Stance command the players will get into the proper stance. 3) On the command Hut or whistle blow the players will start running backwards for 10 yards. 4) Players return to line and repeat as required. 1) Insure that players are stepping back with each step, no wasted steps forward or sideways. 2) Teach players to have a forward body lean, meaning their shoulders in front of their hips. 42 Run Force Drill To teach defensive backs how to force an outside run back inside All Defensive Backs 1) Align your players as diagrammed, you will only need one safety and one cornerback, remaining DBs can play the scout offense and LB positions, then rotate them around. 2) On the snap the LB will slide to the play direction, safety will start backwards, read that it s a run the start a pursuit angle to the ball carrier. 3) The Cb will read run and start forward to front of ball carrier to force him to turn inside to the LB and safety, thus preventing him from getting outside. 4) Rotate and repeat as required. 1) If there is a lead blocker the cornerback may have to explode into the lead blocker, but be sure to bounce outside off the block, not inside, the CB must not give up an outside position. 43 DB Tip Drill To teach defensive backs how to make an interception of a tipped pass All Defensive Backs 1) Align a WR 8-10 yards in front of the QB (coach), with a CB 5-7 yards behind the WR on each side. 2) Coach will make a high pass to the WR who will tip the ball in the air. 3) The DBs will compete to see who can make the catch at the highest point in the air. NOTE: 1) DBs have to remember that the DB closet to the WR should explode into the WR taking him to the ground, which will prevent him from making the catch, while the other one calls I got it and makes the interception. 2) For instructional purpose alone will the DBs compete for the ball in this drill. 3) The focus of this drill is making the catch at the highest point and judging the path of a deflected pass. 45 Open Field Tackling Drill: Team To teach all defensive players to execute a form tackle All Defensive Players Full Pads 1) Split the defense into 2 groups, and pair up each player with a similar sized player in the other group. 2) One group will line up single file beside two blocking dummies (can use a rows of cones, tires, any thing to make the players pickup their feet), this group will be the defenders first. 3) The second group will be the ball carriers. 4) On the whistle a defender will make his way thru the obstacles and then make a form tackle on the ball carrier. 5) The ball carrier will take off at full speed once the defender has started, and the coach will make a pass when the defender has cleared the first obstacle. 1) The defender must keep the ball carrier inside and in front of him to prevent a cutback. 2) The contact point for the tackler is the inside hip of the ball carrier. 3) Make sure the tackler follows thru the initial contact by driving his legs and wrapping up with his arms. 46 Team Pursuit Drill To teach all defensive players to execute proper pursuit angles All Defensive Players Full Pads 1) Align your defense on the field on a yard line. Five yards in front of your defense three coaches align. 2) The middle coach will call a snap count and the simulate a snap and drop back, then throw a pass to either coach on the sideline. 3) On the snap the entire defense will do an up-down then locate the ball and pursue the proper angle to get to the ball carrier. 1) Coach defenders to run full speed; during the pursuit they must be able to adjust the angle on the fly. 2) The defenders must never trail the ball carrier from behind. NOTE: If you have any additional coaches they can be behind the defense and on the sidelines observing the pursuit angles used. 48 Team Stance & Start Drill To teach all defensive how to maintain a correct football stance. All Defensive Players Full Pads 1) Have players align on a yard line. 2) On the command STANCE players will assume their starting position. Hold for 20 seconds, then issue a UP command to allow players to relax, repeat 2 more times. 3) Add a quick left/right lateral shuffle, go to one direction, then the other, not back and forth. 4) The final phase is the shuffle with multiple direction changes. The coach will blow the whistle when they players are to change directions, have players change directions at least 10 times. 5) Repeat as required. 1) Insure players are maintaining the proper starting stance throughout the entire drill. 2) Coach players not to pause or lean to the side when changing direction. 3) Teach players to maintain the forward body lean and a low center of gravity with knees bent. 49 Power Tackle Drill To teach all defensive players to wrap up and tackle All Defensive Players Full Pads 1) The ball carrier stands facing the sideline. 2) The tackler is aligned in front of ball carrier, one yard apart. 3) On command the ball carrier turns, faces tackler and charges tackler. 4) After contact is made anything goes the ball carrier can spin, cut, retreat, run over the tackler anything. 5) The tackler must bring the ball carrier down. 6) The tackler should attack the ball carrier and drive him backwards into the ground. 1) The tackler must do the following for a good tackle: a. Keep head up. b. Knees slightly bent to create a low center of gravity. c. Explode thru the ball carrier, as if he was on a spring, drive thru with the legs. d. Make contact with a lower shoulder pad level than the ball carrier. e. Wrap up and hold on. Never stop driving the feet until the whistle. 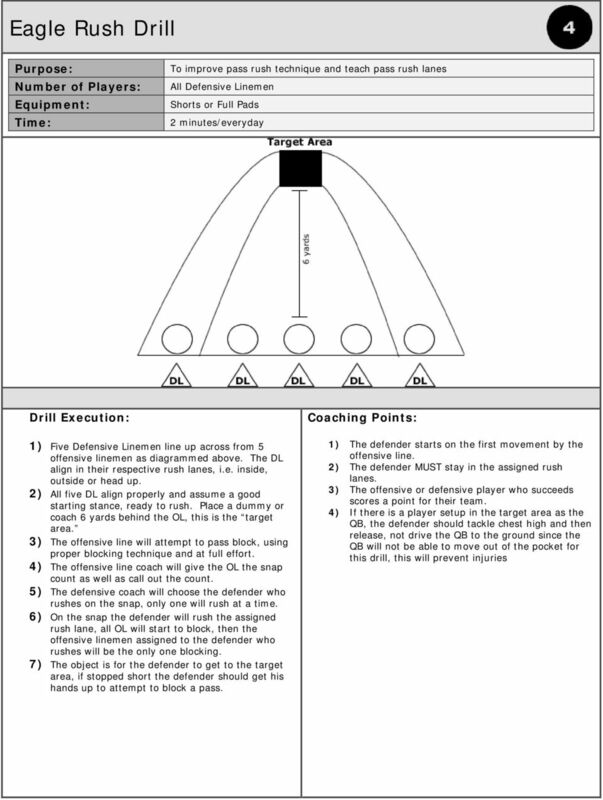 51 5 Yard Drill To teach team defense and field position awareness All Defensive Players & Scout Offense Full Pads minutes/once per week 1) Align your defense against you offense or offensive scout team. 2) Place the ball on the one-inch line, with the offensive team coming out of the end zone. 3) If the defense stops the offense from gaining 5 yards the ball goes back on the 1 inch line, if the offense gains 5 or more yards the ball is placed at the end of the play. 4) Once the defense is beyond the 5 yard line if the defense stops the offense for less than 5 yards the offense will start the next place backwards 5 yards. 5) Assess all penalties as normal. 6) Once at mid-field, flip sides and now the defense must stop the offense from scoring 1) Field position will dictate which defensive calls are made. 2) At some point you will have to stop the drill if the scout team is struggling. 3) This drill promotes team unity, a possession attitude and controlled confidence. 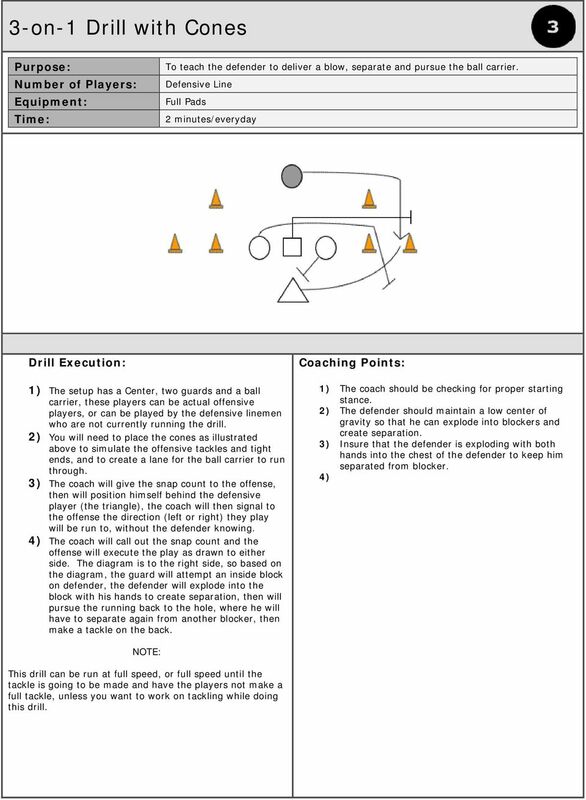 52 Circuit Tackling To set the temp for practice and teach proper tackling techniques All Defensive Players Full Pads 1) Set up four stations, divide defense into 2 groups, the first group will be tackling, the second group will be split up among the four stations to be blockers and ball carriers. 2) The tacklers will lineup at the top-right station and rotate one at a time in a clockwise direction, one after the other, each player gets 2 times thru the circuit and then flip the groups. NOTE: 1) Try to match up players size wise if at all possible, it is safer in the beginning, but the simple fact is that eventually a small player will have to tackle a big player. 2) Insure all tackles are being made correctly and safety is paramount, no face masking, spearing, etc.. 3) Stop the drill to fix any fundamental tackling issues. Have a coach or at least a parent at each station if possible, if your by yourself just run 1 player thru all four before letting another player start. 53 Pass Pursuit Drill To teach all defensive players to execute proper pursuit angles All Defensive Players Full Pads 1) The defense will align on the ball, a QB (coach) will be lined up with the ball. 2) The QB will call out a snap count, simulate a snap and drop back 3-5 yards. Then set and make a yard pass to a designated area. 3) The entire defense will pursue to the ball and form a 360 perimeter around the ball and run in place until the whistle is blown. 4) If a DB is there to intercept he may intercept, but may not return, the defensive unit will circle around him and run in place. 1) Insure all defensive players start the drill properly aligned and in the correct stance. 2) Excellent drill to start or end defensive practice. 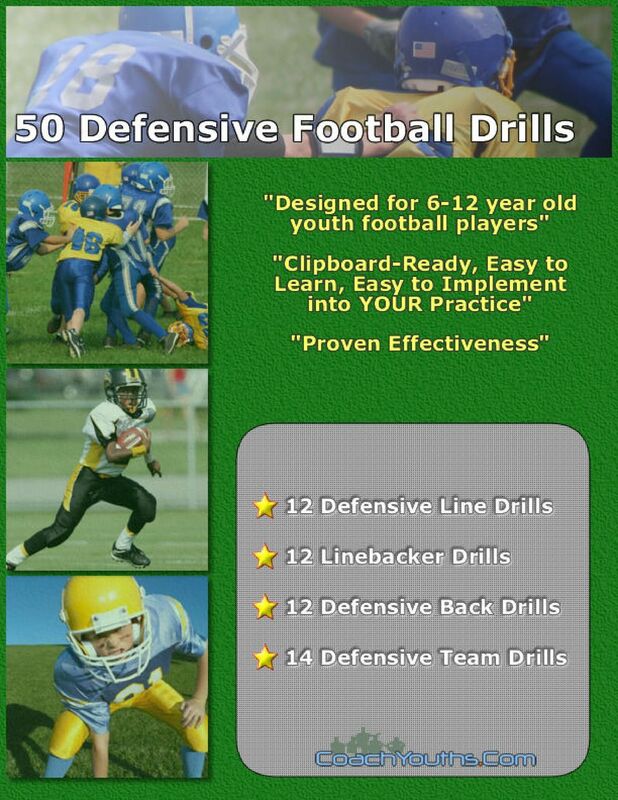 54 Wheel Drill To teach all defensive players how to maintain body balance and foot quickness All Defensive Players Full Pads 1) The defender aligns in a four-point stance, with his hands in the middle of the four bags. 2) While in this position his head is up and feet under his hips. 3) On the whistle the player maintains his four-point stance how ever moves his legs over each bag working in a circular direction, once the first foot makes a full circle the player reverses direction. 4) After returning to starting location the player stands up and sprints thru the bags and over the last one. 5) Repeat as needed. 1) Defender must maintain his hands on the ground in the center of the bags. 2) See how quickly your players get fatigued and are fast are they coming off the ground into the spring. 3) Timing the players is a good way to create competition amongst the players. 55 Zone Run Drill To teach linebackers and defensive ends to work together against inside runs All Linebackers and Defensive Ends Full Pads 1) Rotate your players thru the four scenarios diagrammed above. 2) Start by walking them thru them and point out the difference in how the linemen will block each type of play, this will help players recognize the plays on game day and react quickly. 3) Then increase the speed. 1) It s a good idea to have these 4 scenario diagrams during practice to show the scout offense EXACTLY what to do so they give your defensive unit a good look. Passing and Catching the Basketball The Five Passing Lanes Each game situation presents the possibility for one perfect pass. Imagine yourself faced by a defender crouched over in good defensive position. 3. Simplicity of the offense (few plays to remember) develops great confidence in execution.